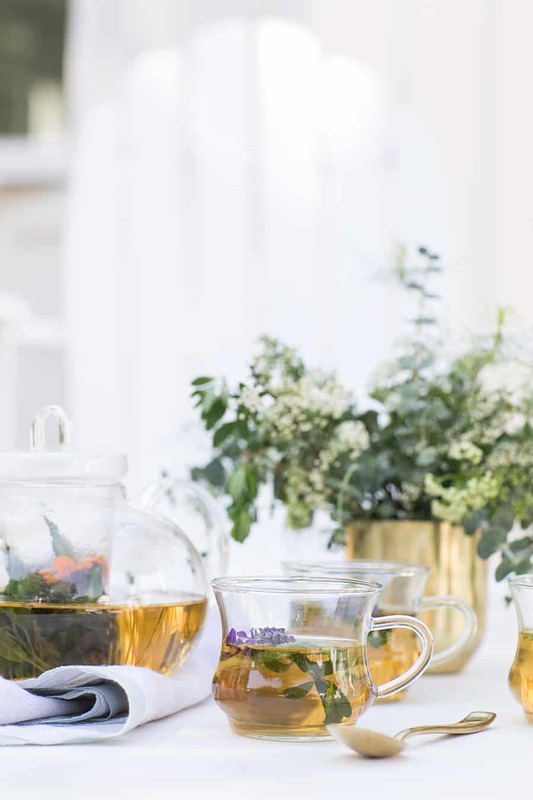 We shared some charming ideas on how to create a tea garden and now we thought it would be fun to make a few things using our tea herbs! 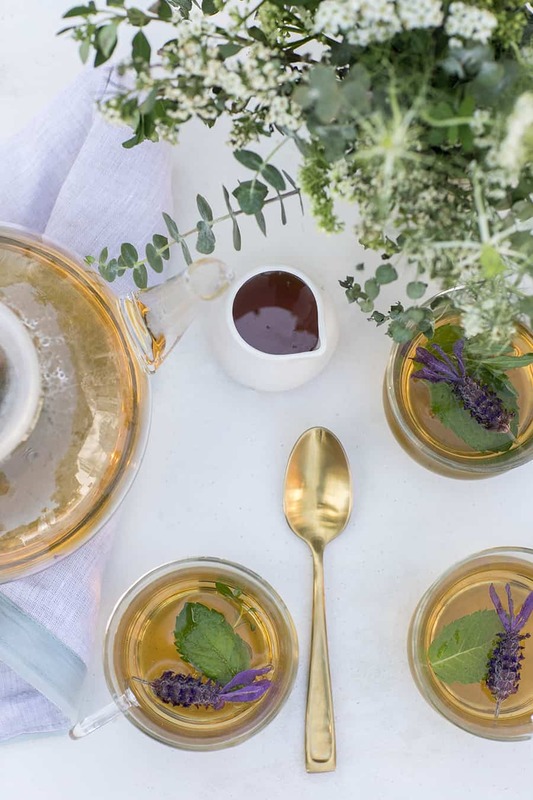 When it comes to making recipes and teas with herbs, the possibilities are endless. 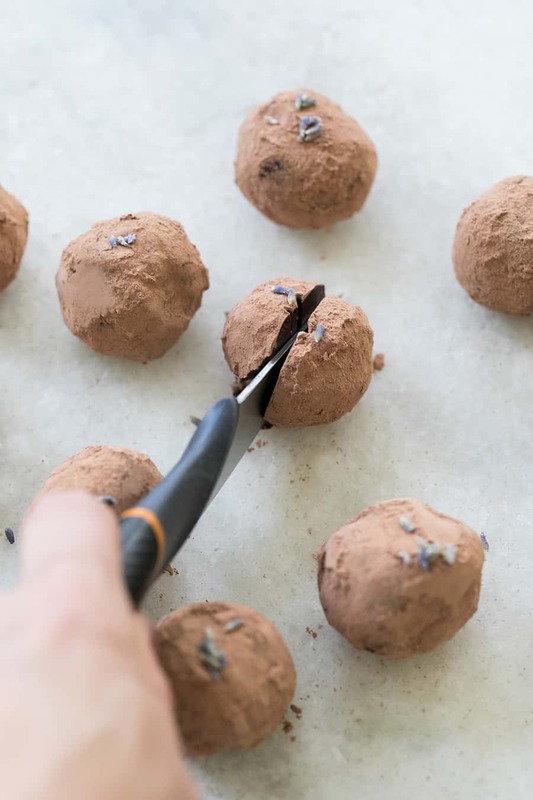 There are so many things you can make, so I narrowed it down to 3 ideas and made a hot tea using fresh herbs, a cold brew tea and dark chocolate lavender truffles…all made with the help of my new Fiskars Summit Knives . 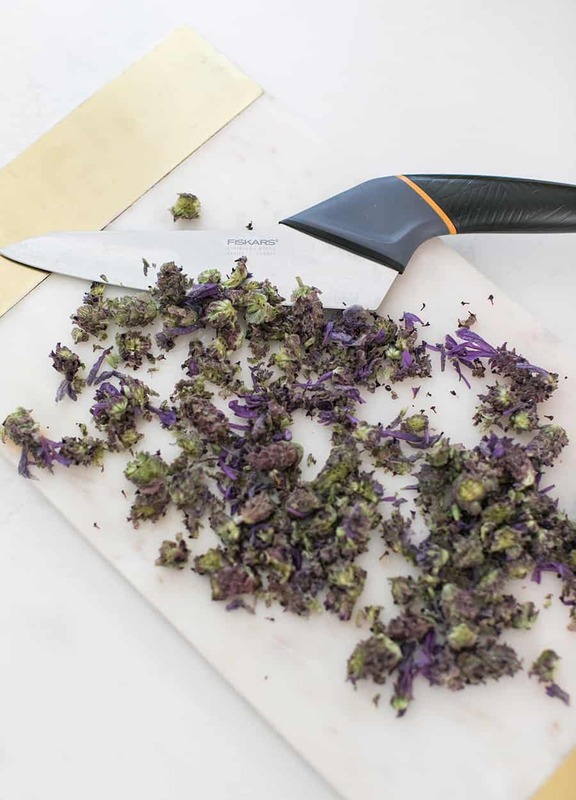 I needed new knives so badly and the Japanese-grade stainless steel blade ensures smooth, easy cutting, chopping and mincing. 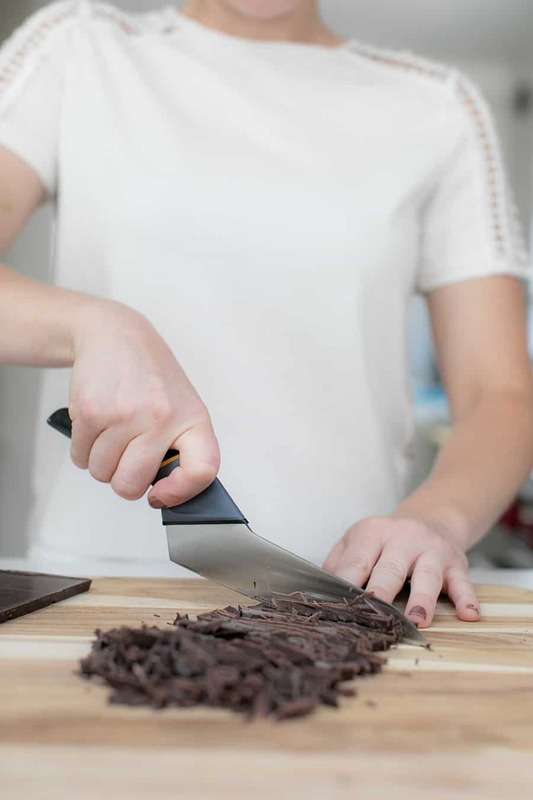 Additionally, the chef’s pinch-grip handle is perfect for precise and comfortable cutting. 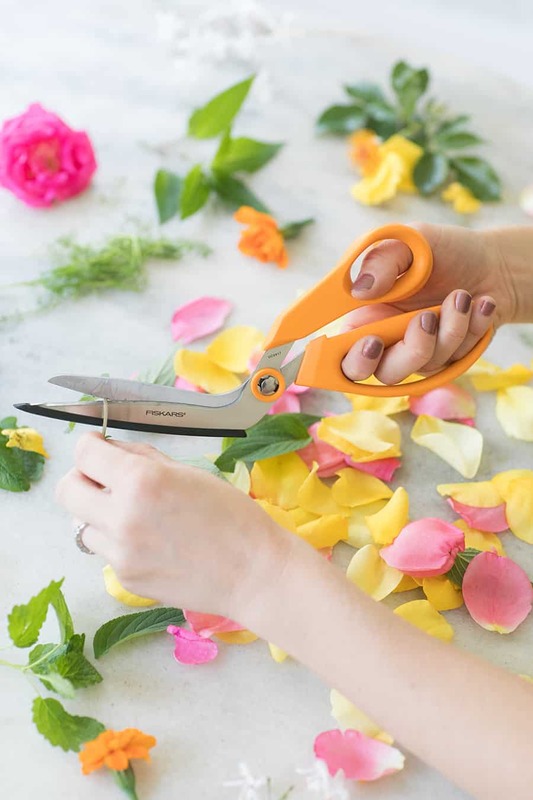 I also used their Non-Scratch Kitchen Shears to snip stems off, which worked great! 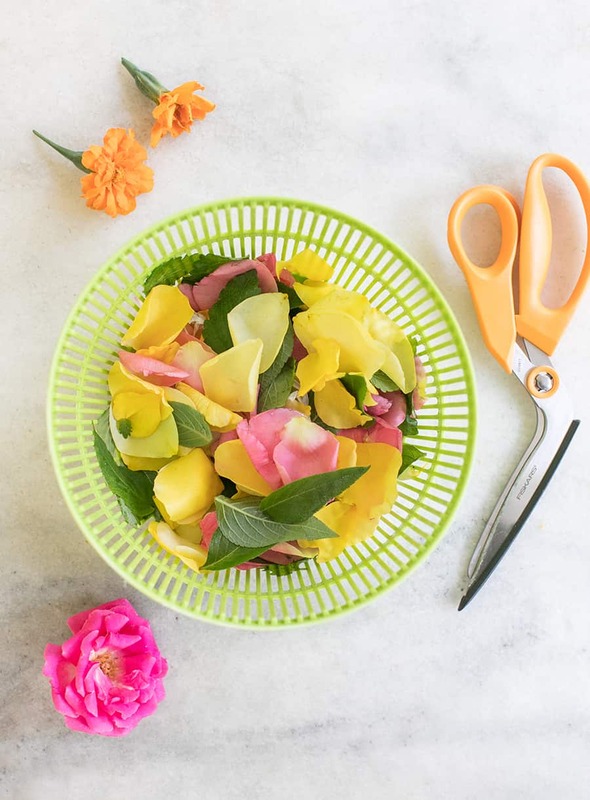 These are ideal for cutting cleanly in one pass and the nylon base allows you to cut on just about any surface without worrying about scratching it I can’t even tell you how happy I am to have updated cooking knives that also have a safe guard on them to protect them during washing and storage. To make a hot tea from fresh herbs you want to pick the herbs earlier in the day to avoid bitterness. 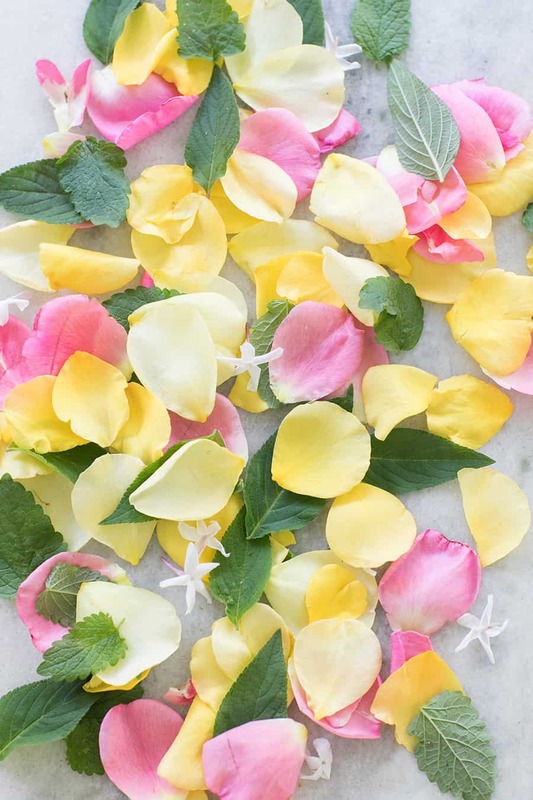 Trim off the stems and then wash really well before you add them to the tea pot. 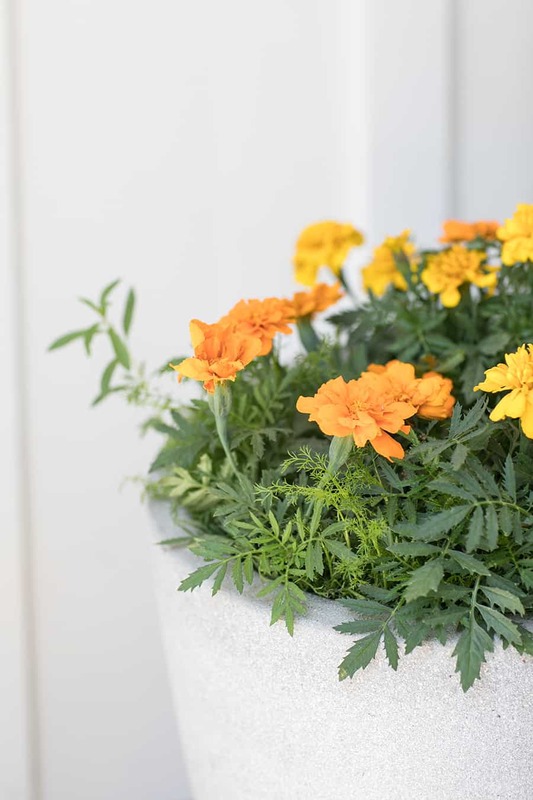 You also want to use a pot with a filter to catch the leaves. Boil water and pour over the top. Then let it brew and serve! 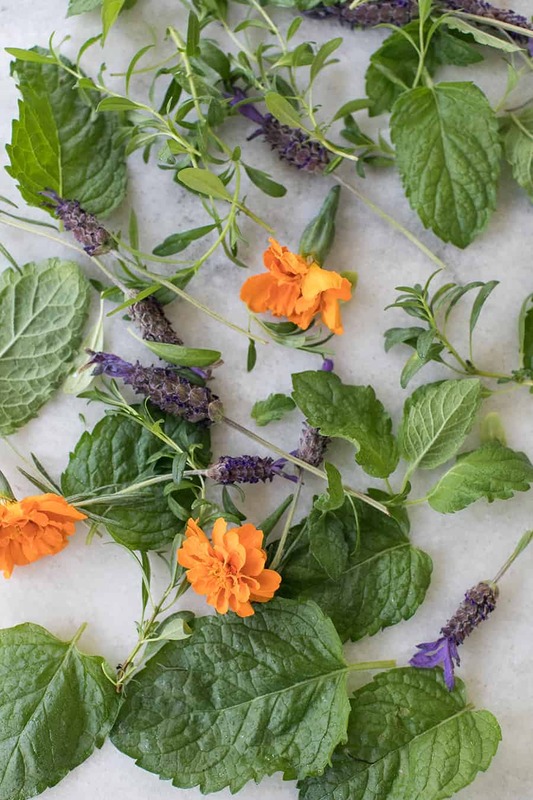 For this brew, we used Hyssop, lavender, marigold and mint. Loved the combination and it tasted so fresh! 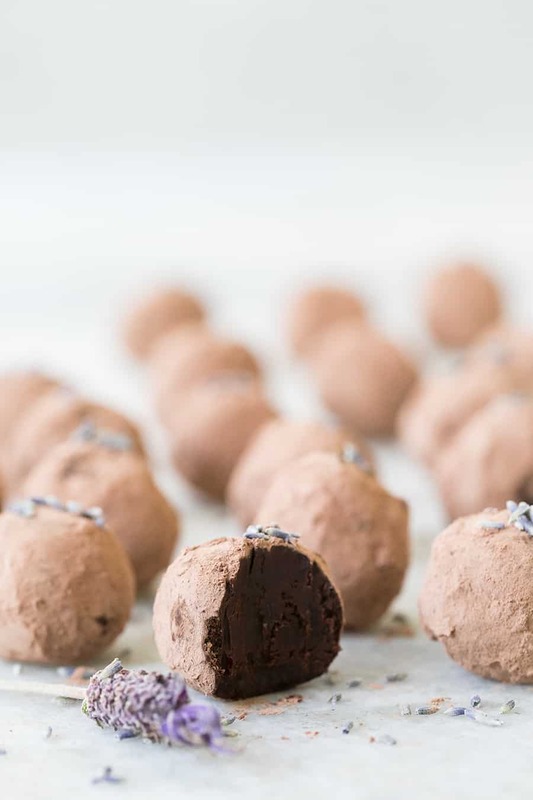 It went perfectly with the dark chocolate lavender truffles! 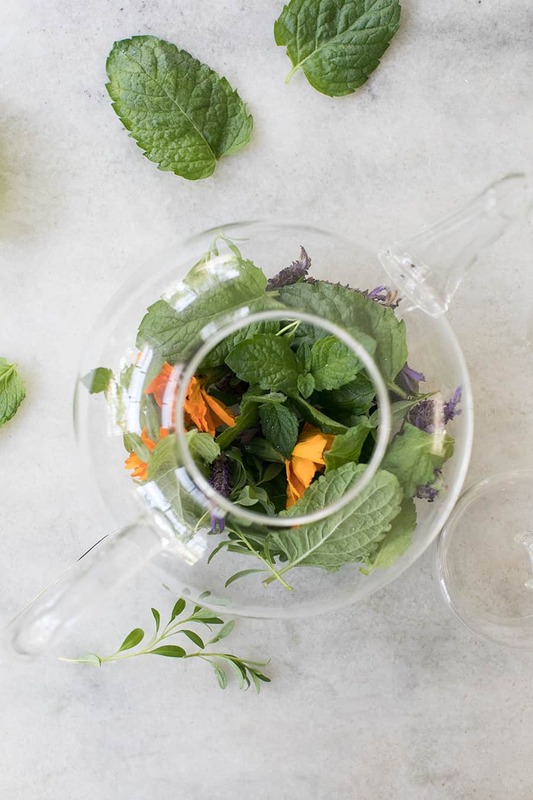 You can also make a cold brew tea using fresh herbs and a bottle with a filter. 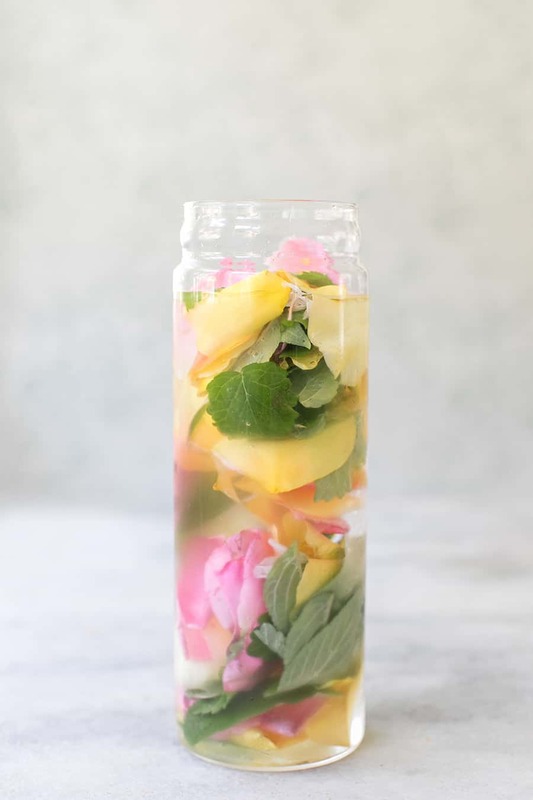 For this cold brew, we used fresh rose petals, pineapple sage and lemon balm. 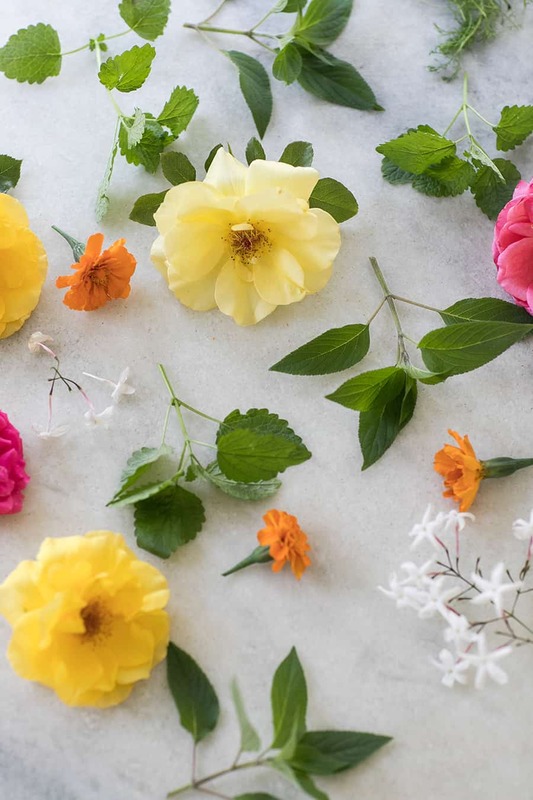 Fill the bottle with about 1 cup of fresh, washed flowers and herbs from your tea garden. Pour warm water over them and then refrigerate until cold. 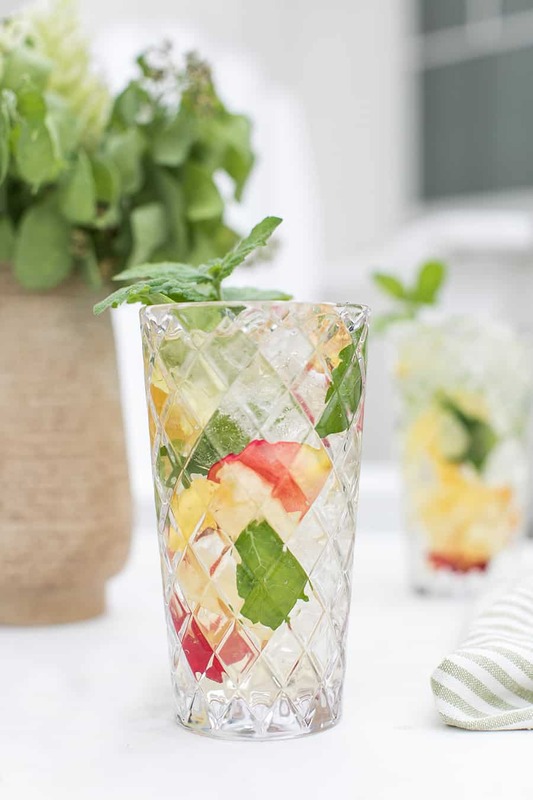 Pour over ice and enjoy! 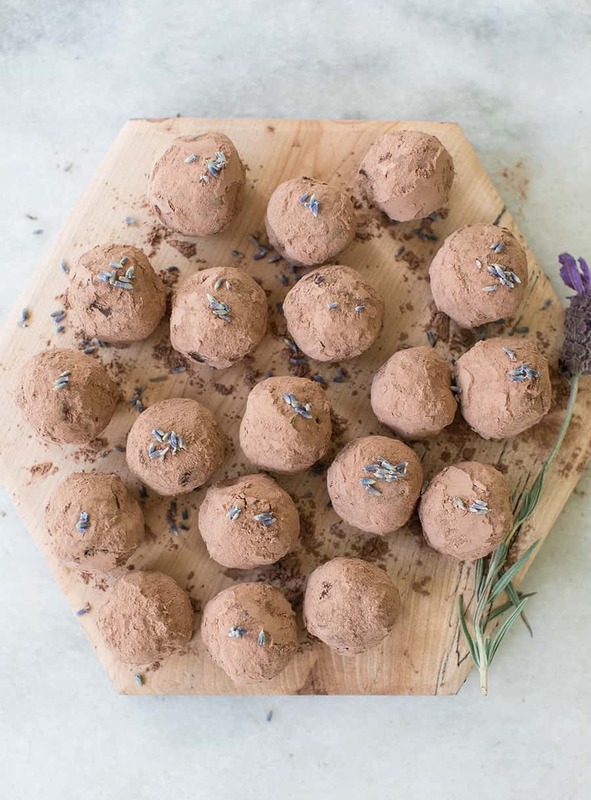 These dark chocolate lavender truffles are so rich and decadent. They’re the perfect small sweet treat to enjoy with tea. 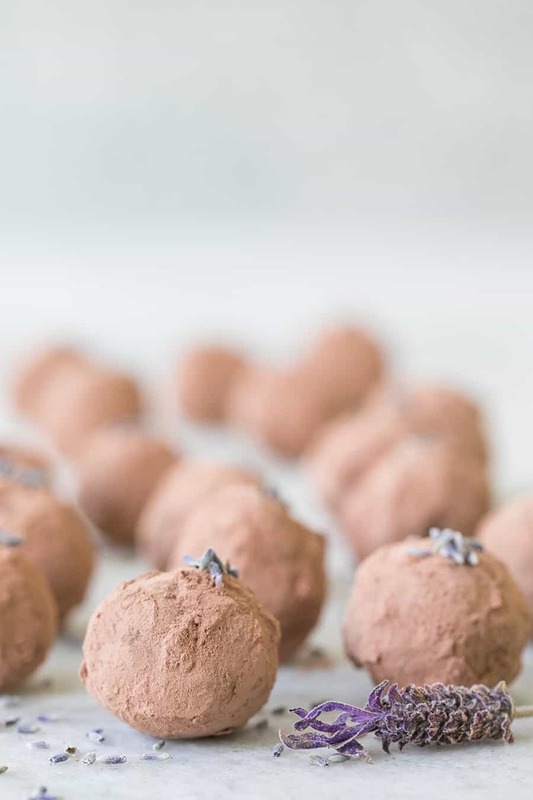 We used fresh lavender,that was harvested from our tea garden, dark chocolate combined with semisweet, espresso, orange liqueur and cream. They’re so good! Oooh, the iced tea sounds lovely! Once we get settled in our new place I’ll give it a try. I love herbal iced tea.